This (self-drafted, non-exhaustive) list outlines individual causes for the poor taking on unsustainable debt. It shows that there are mulitple reasons for the poor falling into microfinance debt traps, and that most are outside of their control. Prior indebtedness: if the poor are already in debt before they come to an MFI, which is likely, the new loan will be an additional burden unless interest rates are sufficiently low (which in AP they weren’t). Business failure: (assuming a client actually uses their MFI loan for business purposes) microbusinesses fail regularly. MFIs’ clients operate in highly volatile economic environments which are usually already saturated at the lower end, creating a high risk of entrepreneurial failure and thus deeper debt. 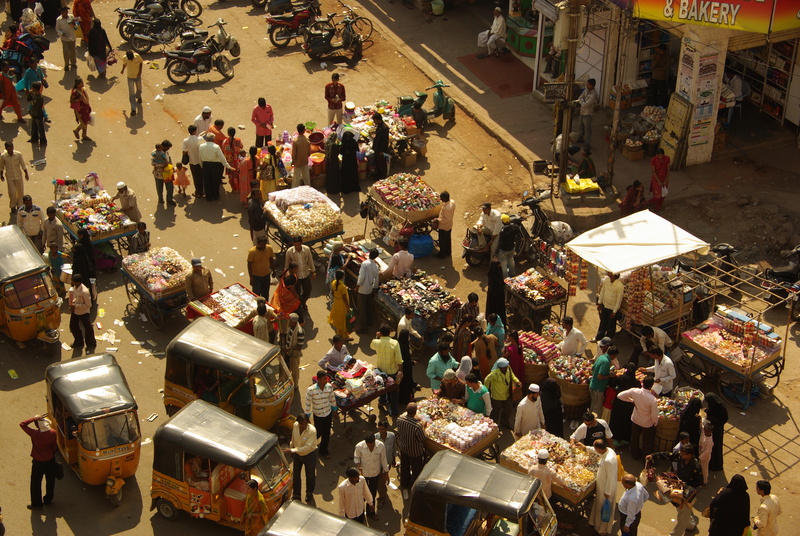 The low end of the market in Andhra Pradesh is saturated – microbusinesses everywhere (own photo, Hyderabad). Consumption borrowing, needs borrowing: some borrowers make unwise decisions, but many are so poor that they must use loan funds to cover the costs of immediate survival needs, such as rent, food or medical assistance. The interest paid on their loan can effectively increase the cost of those bills by 1.5 to 2 or more. Unsustainable, excessive or dishonest interest rates – there comes a point where, no matter how profitably a loan is used, the interest becomes too large to be covered by business proceeds; lower rates would mean mean more profits retained by the poor and less debt burden. High rates may be “sustainable” for MFIs but unsustainable for borrowers. Additionally, MFIs often hide the real interest cost by quoting flat interest rates or charging hidden fees (see Times of India on this). Graduated lending: offering a larger loan to a borrower at the end of a completed loan cycle is not bad per se. But in many cases MFIs require borrowers to take larger loans, leaving the poor with the only choice of taking on greater debt or exiting the programme. Skewed repayment cycles: in some cases, MFIs such as Grameen operate repayment modalities for their loans which require large lump-sum payments (for instance loan fees) at the end of the loan cycle. This creates a bottleneck in borrowers’ finances, which often leads them to borrow at higher interest rates from other sources and use the next MFI loan to repay the temporary loan, which in turn must be repaid with fees, and so on. Multiple borrowing and multiple lending: most overindebted poor are indebted to more than one creditor and must balance the repayments to all creditors. While a client may be ‘performing’ well on one loan, she or he may be in arrears on another, making her or him subject to higher interest rates as a punishment and harassment from that lender’s agents. As the dust settles in AP, I predict that all these causes will be found. Webs of reasons will account for each suicide and will lead to complex fault-finding discussions; but it was the debt that pushed the debtors over the edge. the same was the case for subprime borrowers in the USA who perhaps in some cases lost a job or fell ill, but never should have been granted the loan which brought them under an excessive debt burden in the first place (they were, however, lucky enough to find government assistance forthcoming). Evidence is that in AP the incentives at the micro level were geared toward pushing clients to their desperate measures. According to local newspaper reports, in one village a credit group kidnapped a borrower’s ten-year-old daughter to enforce repayment (according to other reports it was MFI employees); police had to intervene. In many other cases, a government study found that MFI agents had urged non-performing clients to commit suicide; under the loan terms, borrowers’ debts were covered by insurance in case of death. Clearly these are unintended outcomes of schemes which sought to: (1) outsource repayment risk to client groups, thus getting altercations resolved within existing social networks, (2) protect families against debts incurred up by a deceased member. However, under heavy pressure for repayment, both schemes have taken perverse (yet perhaps predictable) twist. Among MFIs that have an SIS [Staff Incentive Scheme], the average fixed salary is $295 per month and the average variable salary among those that receive an incentive is $160 per month. In an incentivising MFI, therefore, a satisfactory (average) employee would earn 55 percent on top of their fixed salary – a sizeable share which would be even higher for above-average loan officers. Most incentive schemes also pay out more for larger loans, encouraging agents to step up loan sizes over time. On October 4, unable to pay back the five loans she had taken, 23-year-old Bandaru Padma jumped into the village well along with her two children. “The total outstanding against her name was Rs 79,000. She had taken loans from Sharemicrofin, Spandana, SKS, Basix and L&T,” says Padma’s father Balaiya. In the villages of Medak district, there is no sound as dreaded as that of a motorcycle in the morning. By the time the loan recovery agents reach the villages on their bikes, the men here would have left their homes in order to avoid meeting them. The women scamper for cover but have no choice but to meet them. The recovery agents who are spreading terror in the villages are far from being the toughies they are made out to be. “They are mostly youngsters who apply for vacancies of ‘business developers’, ‘helpers’ and ‘assistants’ advertised by the MFIs. Once they get the job, they are assigned the task of recovery with a carrot-and-stick approach. There are incentives for maximum recoveries and threats of being fired for every bad loan. The MFIs make sure that the recovery agents assigned to one village hail from the nearby town and belong to a caste that is higher than those living in the village they have been assigned to,” explains a recovery manager of an MFI. Add to this potent mixture the (usually compulsory) loan life insurance which has become common in Indian microfinance, and it is a small step for an unscrupulous (or financially cornered) loan officer to realise that a non-performing loan will become a fully repaid loan if the client happens to be dead. The life insurance thus becomes a death bonus. If certain MFIs are now beginning to play the blame game, feigning innocence while pointing fingers at a few black sheep, they are stealing their way out of the responsibility for a system they helped to create. At fault are neither faceless market mechanisms (for microfinance in India is no real market), and neither are any individual MFIs – but rather the pervasive market logic governing the entire sector. To me, the up to 60 deaths because of misguided lending are already a disaster. That’s why I’ve tried to divine the roots of the crisis here. In seeking an answer to the big “why?”, I’ve identified four clusters of causes. In my last posting, I pointed to macro-level causes: (1) that the drive for profitability among MFIs led to an overcharging of borrowers; (2) that the sector failed to regulate itself and the Indian government failed to regulate from above. In this posting, I have discussed micro-level causes: (3) that the inherent debt dynamics of being poor in the presence of MFIs easily lead to overindebtedness; (4) that MFIs have created incentive structures which favour both coercion and suicide. Microfinance set out with a goal similar to that of the pigs in Animal Farm: to make everyone more equal. Right now in AP it looks like microfinance has achieved the same result as the pigs in Orwell’s fable: to make some more equal than others. Some (a few borrowers and shareholders) prosper, while others fall deeper into debt. The point I am making is that microfinance is nothing new. It has existed for a long long time. The workings have been exposed and outrage has piled up on the corporate ones only now when moneyed, educated, sophisticates have entered the fray with truck loads of money – from other banks and the public – and have stopped pretending that they are here for doing good. Once we accept that microfinance like any other form of business has the aim of making money for its stakeholders, including the borrower, the bitterness goes away. Of course it’s nothing new to say microfinance has come in and merely replaced the moneylenders – as the WSJ reported last year, it may even help the moneylenders – but the one big difference between MFIs and traditional moneylenders is that microfinance set out to make the world a better place, not just make a buck. Then, in recent years, the idea was tacked onto microfinance that it could, and then should, make a buck in achieving its goals. The AP tragedy brings out harshly the tradeoffs involved. Far from bringing a better local financial environment, the drive for “sustainability”, “outreach” and “competition” can lead to suffering and harm for borrowers. Actually, we could have learned that from the moneylenders – who are profitable, reach even remote villages, and do compete – decades ago, without billions spent on pilot projects, start-up funding, academic research, backslapping conferences, and non-funding of other development efforts. As yet, to me it’s unclear what role the Self-Help-Group model, which is prevalent in AP, could have played in this – exacerbating the debt crisis, or cushioning its effects? Also, it’s still too early to tell what effect regulation will have – bringining the sector under control, or just setting it back, or collapsing it entirely? I have no doubt that the poor need financial services, like everyone else does. But, first, to a large extent the poor already have loan sources; so if microfinance and moneylenders cause the same problems, why bother with microfinance? That’s a serious question for me. Second, as I’ve tried to show, most poor people need anything but a loan. Probably they need a decent job, a safety net, and a savings account. Profit-driven microcredit companies don’t fit that picture. The poor are in no condition to take on debt, and it should not be the way we should continue envisioning their route towards development. We should learn this from the tragedy in AP, in order to prevent the next one. Here is an insightful piece published on IMBN by two practitioners from Tamil Nadu, also trying to get to the causes of the crisis. It echoes a few of my points: http://indiamicrofinance.com/ap-causes-crisis-microcredit.html. I just changed the second part of this blog’s title from “The chickens have come home to roost” to “Debt traps, life insurance and death bonuses” … it reflects the content far better.